We are a bunch of people located in bay area, California, USA, in Delhi and other locations who are grateful to JinVaani for changing our lives, giving us peace and putting all our questions, concerns and confusions to rest. We all are together on the path of self realization and ultimately liberation. We hope that JinVaani.Org will enrich all of us and also help us in exchanging the JinVaani treasures that we have in different forms (pravachan, shastra ji, bhajans etc.). 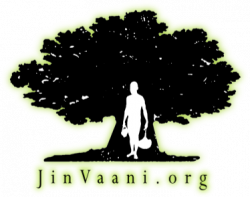 This website is a non-profit humble effort to bring all Jain resources like Jain Pravachan, Videos, Books, and Jain Bhajans together under one site for everyone and anyone. Please download, listen, read and transform your life for better. This is the main aim of JinVaani.Org. तुम फूँक कर, सुर को सजा दो,मैं सुर में समाना चाहता हूँ..
खोखली बंशी ये अपनी, तेरे लबों से बजाना चाहता हूँ..
वीतरागी फूँक से, इसको बजाना चाहता हूँ..
तुम फूँक कर सुर को सजा दो, मैं सुर में समाना चाहता हूँ..
मैं हो गया था बाँस पर अब, हो गया हूँ बाँसुरी..
श्वांस अब तेरी ग्रहण कर, संगीत होना चाहता हूँ..
संगीत की भाषा समझ मैं, लय में समाना चाहता हूँ..
आप जैसी बाँसुरी, मैं भी सबको सुनाना चाहता हूँ. पूछा नहीं तुम्हारा सुख दुःख.. If you want have any Jain resource (audio, video or document) that transformed your life, feel free to send it to us and we will publish on our website. We would like to publish the credits as well as recognize & honor the sources of information published on this site.